We have a HUGE demand for puppy foster homes. 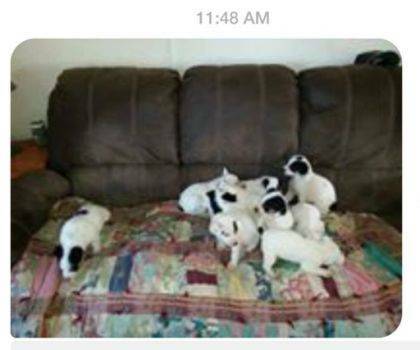 The puppies are just waiting for EAPL to have openings. They are so easy to care for and need so little; just a warm place to curl up and a room to play in. Do you have a spare mud room, a bathroom, a hallway where you could put up a baby gate and some newspapers and a few old towels? EAPL will supply the food and vet care. EAPL is very fortunate and we usually get our puppies adopted out pretty quickly to pre qualified homes. We have an urgent need NOW to save over 25 puppies if we can find foster homes. Even if you can just take two or three or more it will save that many more little lives! We had one foster home, here in Evergreen, contact us last week saying that she would take 9 puppies to save a group of puppies and she had them over night on Thursday "literally" - they were all pre -adopted and we handed them out to their forever homes on Friday! She is taking another 11 this week! She was so excited to see so many lives saved and so many happy excited puppies adopted. We know of so many puppies that are in horrible conditions and/or about to be euthanized and we want to save them all but we have no more room. Some puppies that we have already committed to are in very very temporary situations waiting to be transferred to EAPL - they are in bathtubs, some are in emptied closets that folks have offered, some are in outdoor situations with dog houses just to keep them out of shelters and safe until they can be transported. Thank you everyone - each and every puppy now has a foster home to go to on Thursday. We could not have done it without all of you!